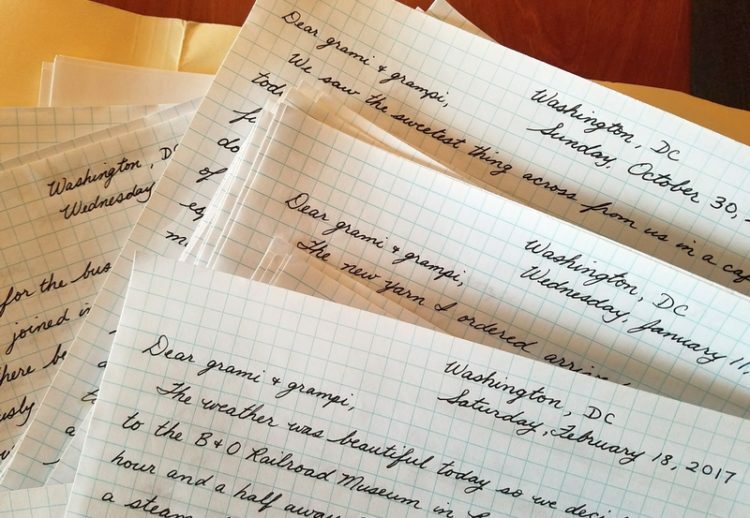 When searching for manuscripts at the Folger—or pretty much any special collections library—it helps to know that manuscripts often lead a double life. Many exist simultaneously as part of a library, and as part of an archive, and libraries and archives have different ways of collecting, organizing, and describing material. Libraries contain deliberately purchased items, and these items tend to be arranged in a human-devised order (“artificial arrangement” in Information Science jargon). 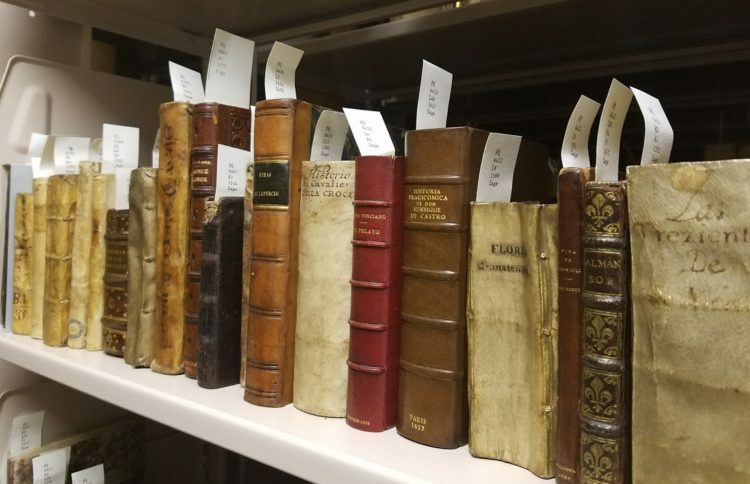 For example, books in the Folger’s Cage collection are arranged by subject using the Library of Congress classification scheme. Random shelf of rare books with “Cage” call numbers. Archives contain items that have been gradually accumulated by a particular person, family, or organization, and these items tend to be arranged in a natural order (“organic arrangement”). Thinking of my own personal papers—a still growing archive—tax returns are grouped together and arranged by year; bank statements are in date order, by bank; and a copy of every letter I’ve sent to my grandparents since I came up with the idea of sending a daily hand-written fax to their care home sits in a folder next to my scanner, most recent letter on top. The Papers of Erin Blake are destined for the recycling bin, but the Papers of the Ferrers Family of Tamworth Castle (bulk 16th – 17th century), the Papers of the Rattray Family of Craighall (1593-1699), the Papers of the Cavendish-Talbot Family (bulk 1548-1676), and many more can be found at the Folger Shakespeare Library. Here’s where the difference between “bibliographic description” and “archival description” comes into play. Simply put, a library collection has a catalog, and an archival collection has a finding aid. A catalog lists each item or group of items in a repository one after the other. Search for a person’s name, and you can click through each online record (or flip through each card) for things by that person. Search for a work’s subject, and you can click through each online record (or flip through each card) for different things on that topic. This is bibliographic description. 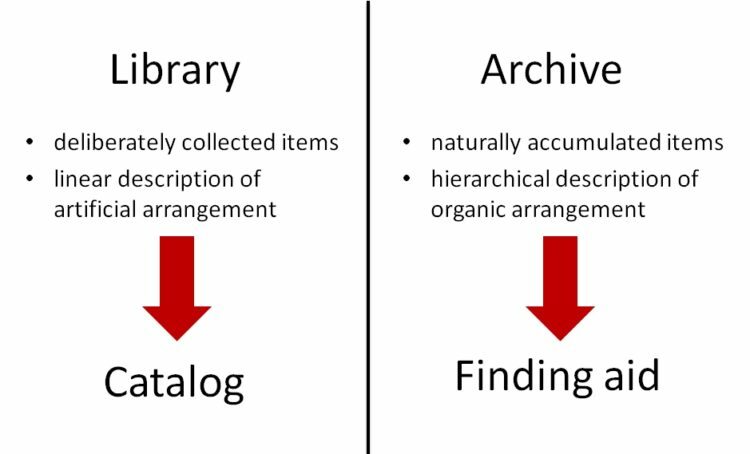 A finding aid, in contrast, provides a categorized, hierarchical listing of the contents of a single archival collection. Go to the finding aid for a specific collection and start scrolling through it (or flipping pages) to see a categorized breakdown of what it contains. This is archival description. Selected finding aids in the Folger’s Reference collection, with Papers of the Rich Family open in the foreground. During the card catalog era, finding aids generally appeared as typescripts, whether bound in book form or just stapled together in a folder. 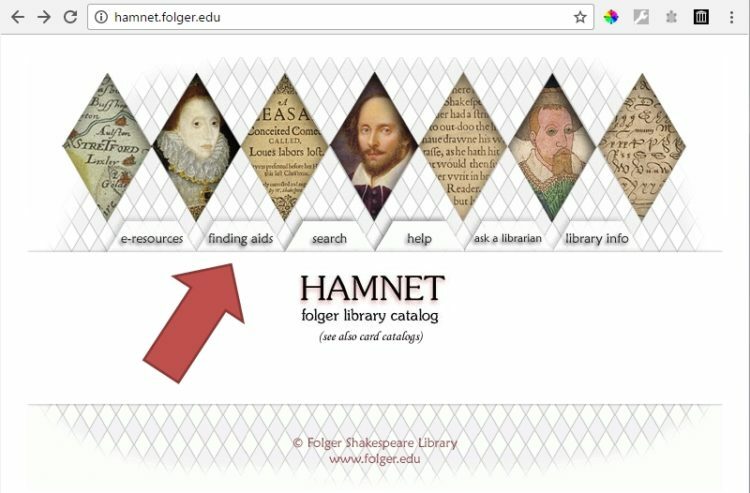 Many of these volumes have now been converted to electronic form, and can be cross searched at findingaids.folger.edu, the Folger’s Finding Aid Database. The Finding Aid Database can also be reached from Hamnet’s “finding aids” tab. 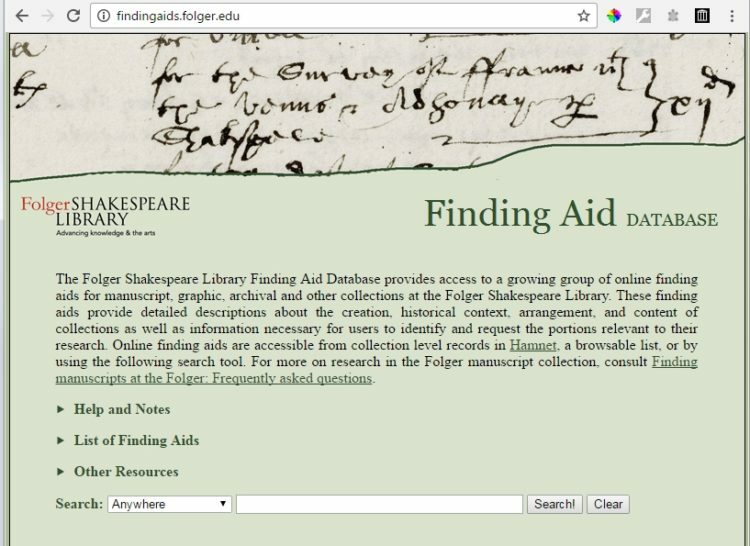 The Folgerpedia article “Finding aids” also includes a useful summary list that groups finding aids into “Early modern” on the one hand and “Shakespeare and performance” on the other. For example, searching the “Item Description for “candle” at findingaids.folger.edu brings up twenty three instances in eight finding aids. Some refer to actual candles, others to Candlemas (February 2nd). 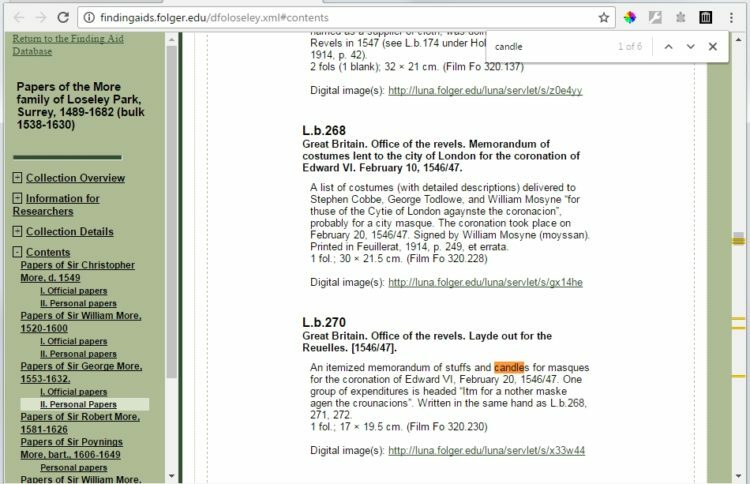 Following a finding aid link in the search results takes you to the relevant section of the document, though you still need to use the “find” option (Ctrl-f) in your browser to pinpoint the term you searched for. 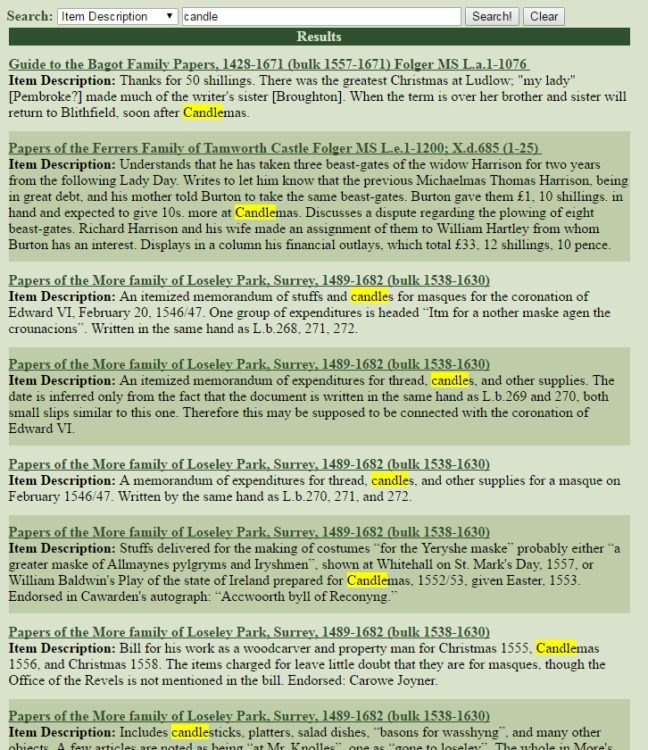 Results of Ctrl-f to find “candle” after following a link to the finding aid for the Papers of the More family of Loseley Park. 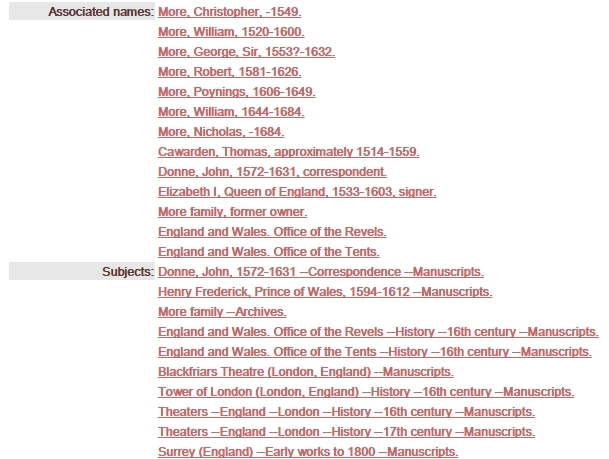 As you can see from the left-hand sidebar in this screenshot of the finding aid for the Papers of the More family of Loseley Park, the first document mentioning candles is part of the Personal Papers of Sir George More (1553-1632). List of Hamnet names and subjects for the Papers of the More family of Loseley Park. The collection definitely has documents relating to more people and more topics than these, so for an exhaustive search, you’ll want to look in both the catalog and the finding aids. It’s also the case that many manuscripts in the Folger collection were acquired singly or in small groups, not as part of an archive. These manuscripts will only be found in the catalog, not also in a finding aid. Lastly, in the interests of full disclosure and as proof that nothing is ever perfectly straightforward, I’ll end by pointing out that “archival description” is not only for archives, and not only for manuscript material. 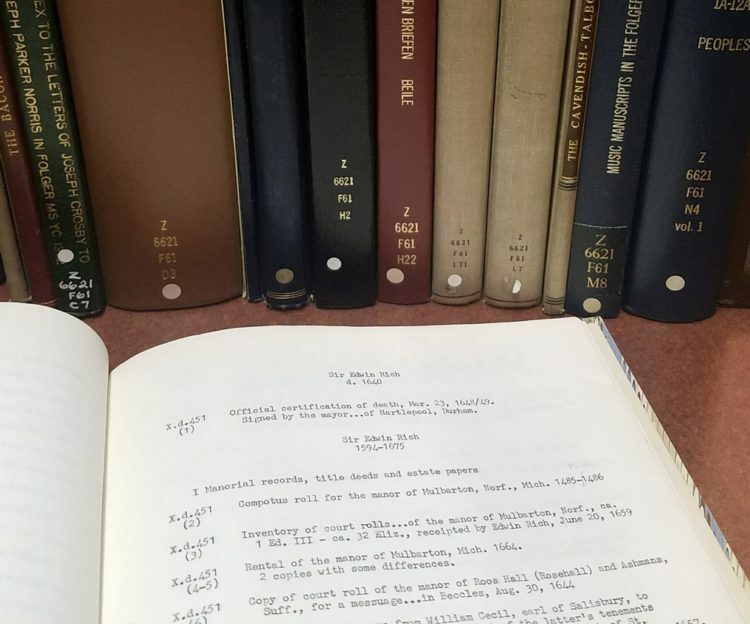 Finding aids can be created for any material that can be conceived of as a group, whether or not it originated together and is stored together. 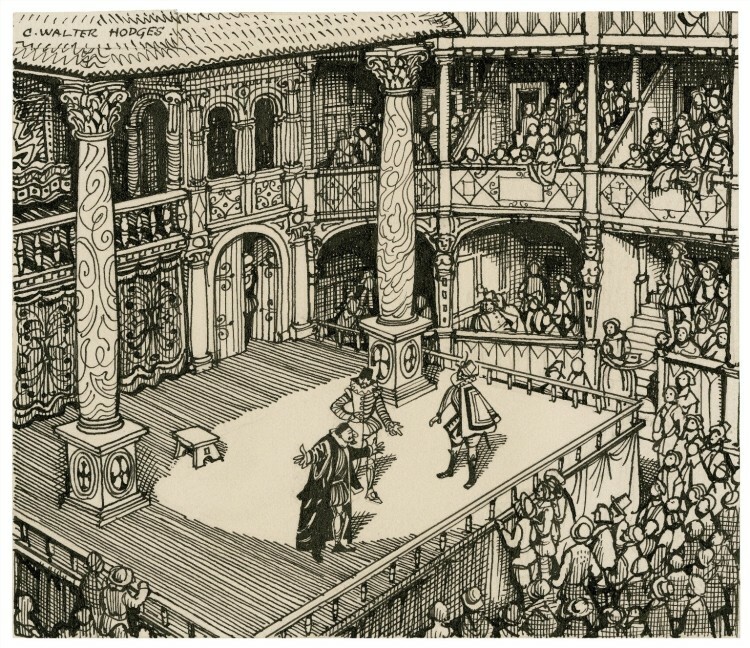 See the finding aids for Playbills in the Folger Shakespeare Library Relating to the Theatrical Career of David Garrick, 1741-1776 and for Stratford and Warwickshire References in the Art, Manuscript, and Scrapbook Collections, ca. 1560 – ca. 1930, for example.